Soon after the first world war broke out in 1914, as there was nothing much doing in the building line, we all shifted over to Birkdale, I having bought some seven acres of land. This property was partly improved having a strawberry patch and a small orchard on it, but no house, so the first thing we did was to build one. My third son Willie enlisted and went to the war. After being there for two or three years he was badly wounded at the Gallipoli landing. He was sent to Malta where he remained for nearly a year, but was eventually invalided home. Being too lame to work at his trade as a carpenter, he obtained employment under the Harbour Board. where be still is, although he recovered from his lameness long ago. The two eldest boys Charlie and Fred did not volunteer, both being married and having small families. Incidentally I may mention, Charlie, although taken on as a pupil teacher, was forced to relinquish the job owing to a misunderstanding between himself and the head teacher and the Education Board. In my opinion he received very unfair treatment. However after several other ways of earning his living, including tram conducting, he eventually started a milk round at Eden Terrace. Shortly after coming to the Birkenhead Circuit where local preachers were very scarce, my name again appeared on the circuit plan, taking services occasionally at Greenfield, Greenhithe, and Albany. On the last occasion I went to the latter place I was returning home driving the circuit trap, when on descending a hill, the belly band broke causing the horse to take fright and bolt, capsizing the trap and then kicking it to pieces. I was fortunate in escaping without injury owing to the fact that I was tipped into a lot of high fern. The circuit trap, being past repair, was given to the nearest settler, the horse was sold and a motor car provided, but I was unable to drive the latter vehicle. Being over the age of 80, I decided not to take any more preaching appointments. Three or four years later, having considerably improved the place, I sold out my Birkdale property and bought another place a little higher up the road on which I built a house. In the meantime the war had ended. Things in the building trade began to look up, so with the help of my son Fred (who also in the meantime had turned to strawberry growing but had given up in disgust) we started building again, taking contracts occasionally one at Papatoetoe and Okoraine, also five or six in Birkdale. I also supervised the building of a Sunday School hall at Birkdale. This hall served a good purpose for a good many years, but as the population gravitated to Beachhaven, it ceased to be of use and was sold for removal, as was also the Birkdale Church itself, the congregation having dwindled down to seven or eight. After living at Birkdale for about 10 years, we made another shift; this time to Birkenhead, having bought a farmlet of eleven acres. There was a 4 roomed house on the property, but this was not large enough for our family. I therefore altered it and added three rooms, bringing it more up to date. 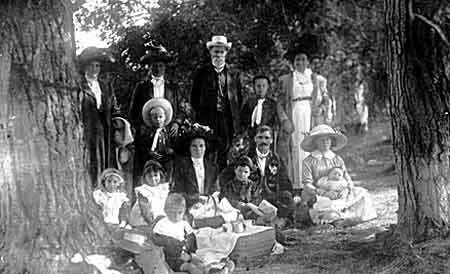 My second family at this time consisted of three sons and a daughter named respectively Harry, Clifford, Frank and Gertrude. Harry, the eldest, was attending the Grammar School and used to travel backwards and forwards on his cycle. Later on he was taken on as a student at the Methodist Theological Collage and in due course was ordained as a minister. Soon afterwards he married a Miss Gladys Roberts of Birkenhead, and they now have a family of four boys and a girl. This however is a digression. When I bought the property at Birkenhead, I fully intended to cut it up into sections to build on. Before I could do this it had to be roaded. It meant extending Wairoa Avenue(now Mahara Avenue), which was a blind street, and it was necessary to get the consent of the owner of the adjoining property. As he absolutely refused to give the necessary half-width of the proposed extension, or pay anything towards the costs, I then tried to buy him out, but without success. So I had to abandon the idea of dividing the land, and bought sections as I required them in Wairoa Avenue. When I bought the property it had only one house down at the bottom end, now it is lined with houses on both sides. With the help of my son Clifford, who I took on as an apprentice (though not legally bound), we built no less than seventeen houses in Wairoa Avenue alone, and several in other parts of the borough. Soon after moving to Birkenhead, my wife opened a draper’s shop at Highbury Corner, which she and Gertie carried on successfully for several years. My next boy Frank, after being a clerk at the Morningside Timber Mill for a few years, married and then opened a fruit shop, also at Highbury, which he still carries on. Both he and his brother Cliff, although both of them married and had families, were called up and had to serve their country overseas for over two years. I am happy to say however, that they both returned safely. Their home coming was saddened by the fact that there was no mother to greet then on their return, she having passed away after a short illness, leaving me for the second time a sorrowing widower. About a year before her death my wife had sold her business. We then decided to have a new house built close by, where in the ordinary course of events she had hoped to live many years, surrounded by her three married children and eight grandchildren who lived nearby, but it was ordered otherwise. Truly the ways of Providence are mysterious. It seems strange that she should be taken and I should be left, considering that she was ten years younger than myself. 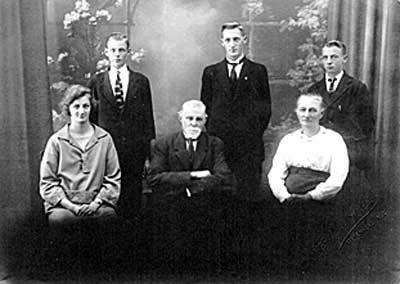 The Utting Family Cliff, Harry and Frank Gerty, Mr F.C.Utting, Mrs Sarah Utting.